This colorful, main dish salad topped with grilled chicken is tossed with a honey-sweetened balsamic vinaigrette. Crushed peppercorns add a pleasant boost of flavor. 1. Mix balsamic vinegar, honey and cumin in small bowl with wire whisk. Slowly whisk in olive oil until well blended. Stir in shallots. Season to taste with black peppercorn grinder. 2. 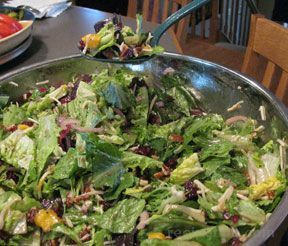 Toss salad greens and vegetables in large bowl. Drizzle dressing over salad; toss to coat well. Arrange chicken strips on top of salad. Twist black peppercorn grinder over salad. Test Kitchen Tip: Prepare as directed, substituting your favorite prepared Italian dressing for the Balsamic Honey Vinaigrette.